Mon 9:00 a.m. 1:00 p.m.
Like New! Garage Kept! Clean Title! The benchmark for Xtreme Performance. Power, suspension, and agility for any terrain. 110 HP Prostar® H.O. Engine: Designed specifically for extreme performance, the Polaris ProStar® 1000 H.O. engine features 110 horses of High Output power and all of the hallmark ProStar® features. This includes dual overhead cams, electronic fuel injection, and 4 valves per cylinder. 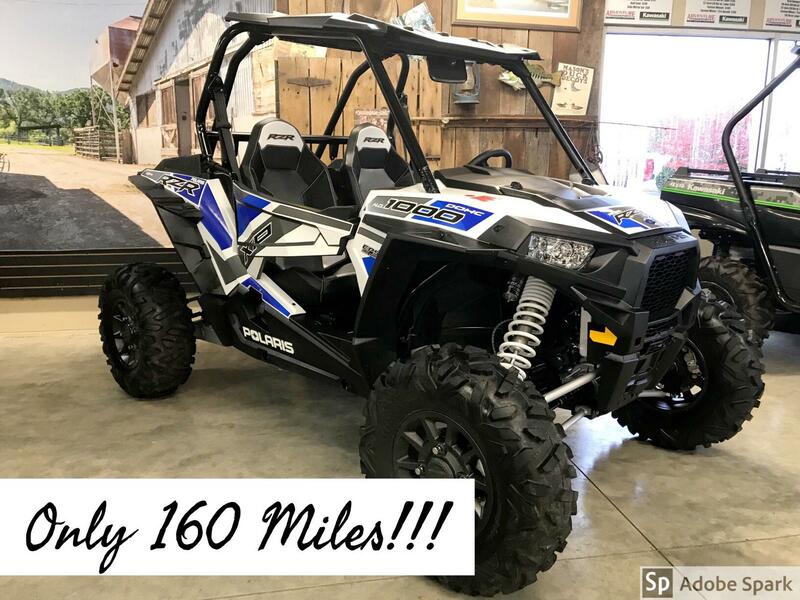 It also features light weight design with massive dual bore 48MM throttle bodies and long-tip fuel injectors giving the RZR XP® 1000 instant throttle response and quick to rev characteristics. High-Flow Clutch Intake System: The clutch cover, secondary helix and ducting system offer a durable clutch system by providing ample airflow to keep belt temperatures low for all-day riding. Near Bottomless Feel with Exclusive Walker Evans Shocks: Industry-exclusive Walker Evans needle shocks deliver next level performance and tuning capabilities. Aside from the ingenious anti-bottom needle technology, the 2.5-inch diameter rear shocks feature tool-less 16-position compression dampening control, allowing you to tune for a smooth ride in any condition. Race-Inspired Suspension for an Ultra-Smooth Ride: The race-inspired 3-link trailing arm rear suspension serves up an incredible 18-inches of rear wheel travel. 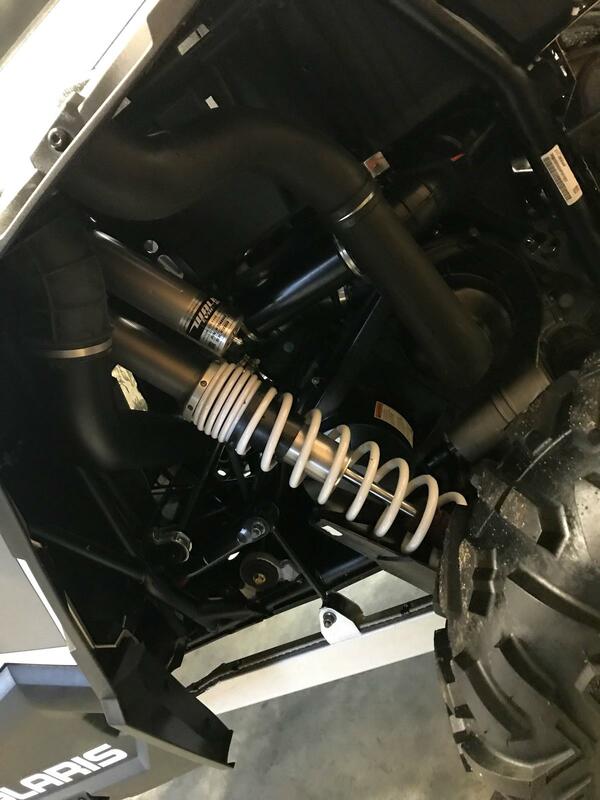 Matched to an astounding 16-inches of front suspension travel with a dual coil-over spring design, the RZR XP® is set-up to conquer any terrain Mother Nature has to offer. 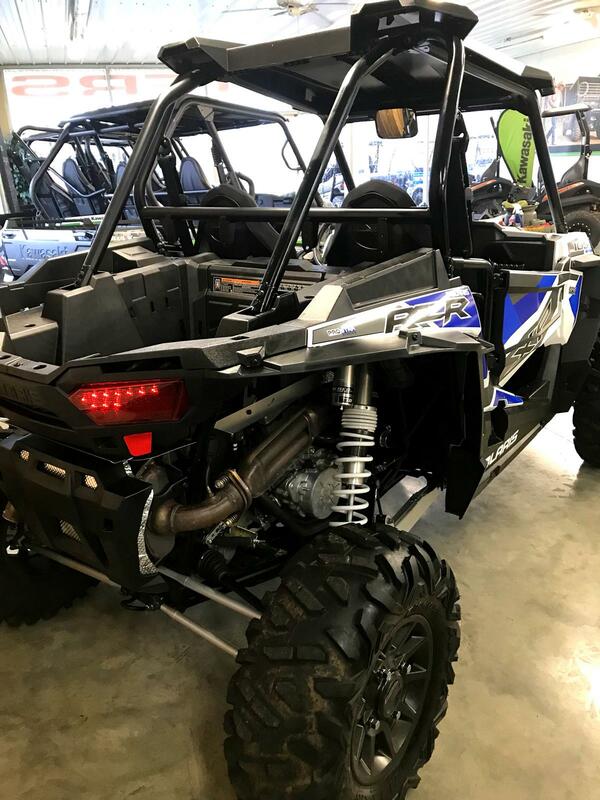 Industry Leading Ground Clearance: The RZR XP® 1000 is built upon a 90-inch wheelbase and 13.5-inches of ground clearance. The chassis and suspension combo smoothes the harshest terrain without unwanted chassis pitch; and delivers unmatched control and comfort without sacrificing agility. Giving you legendary razor sharp handling even in the most challenging terrain. High Performance True On-Demand All-Wheel Drive: The High Performance True On-Demand All-Wheel Drive System features a close ratio final drive to keep the front wheels pulling stronger and longer maximizing power delivery to the ground, even on the loosest terrain. The system provides increased traction without sacrificing steering effort to provide unmatched point-and-shoot handling. 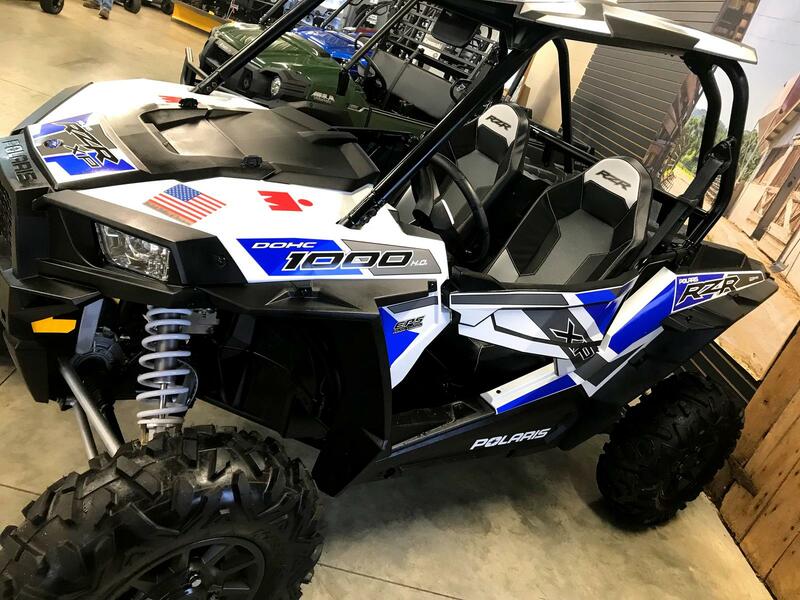 Standard Electronic Power Steering: The RZR XP® 1000 features the smoothest electronic power steering available, with Variable Assist for easier steering at lower speeds for all day comfort and performance. Optimized Driver Positioning: For better driver positioning, the RZR XP® 1000 features an adjustable seat slider and new seat back angle for a more comfortable driving experience. The angle situates the driver closer to the steering wheel bringing the elbows closer to the body for less arm fatigue and a more natural driving position. Comfortable and Convenient Interior: The cockpit of the RZR XP® 1000 offers the most comfort and convenience of any RZR®. Factory installed quarter doors and a High Performance steering wheel with 10-inch tilt adjustability make getting in and out easy. A center storage box place with integrated phone holder places everything within reach, including the glovebox with a quick turn latch. Driver and passenger footrest, height-adjustable seat belts, and adjustable seat slider allows you to fine tune your seating position and Dryseat technology resists moisture, while LED interior lighting adds a touch of style. Removable floor drains allow you to wash out debris and mud quickly and easily. 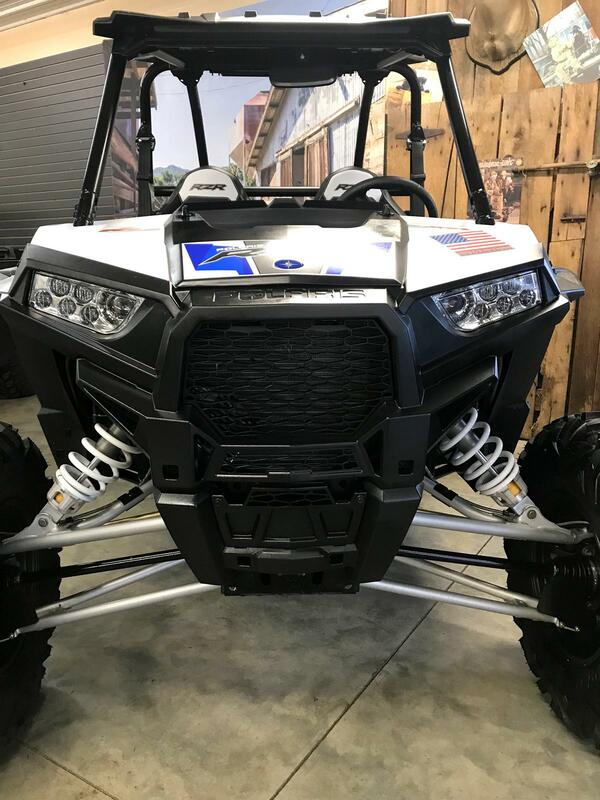 Polaris Engineered Accessories™: Polaris Engineered Accessories™ are designed with the vehicle ensuring the highest quality of design, integration and function. 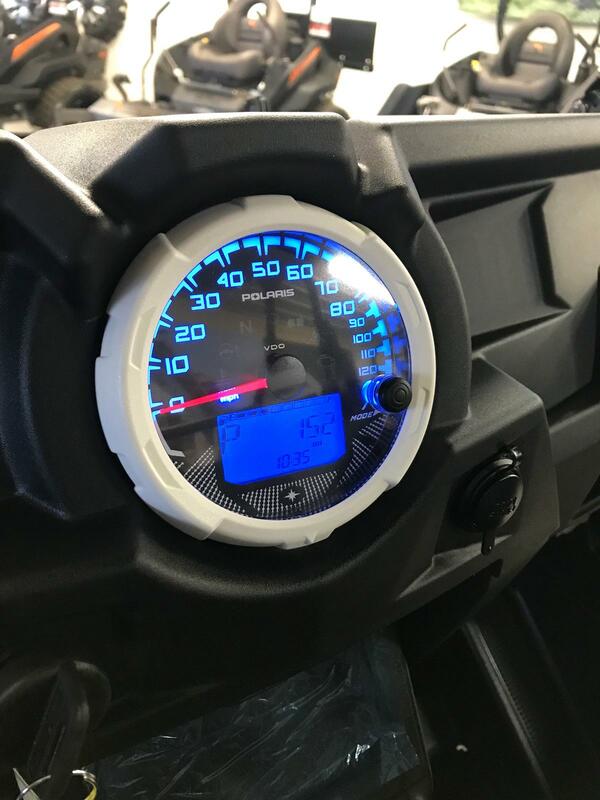 Polaris Engineered Accessories™ come with a one-year factory warranty and do not jeopardize your vehicle warranty, making them the preferred choice for customizing your RZR®. The Polaris RZR® can be hazardous to operate and is not intended for on-road use. Driver must be at least 16 years old with a valid driver’s license to operate. Passengers must be at least 12 years old. Drivers and passengers should always wear helmets, eye protection, and seat belts. Always use cab nets or doors (as equipped). Never engage in stunt driving, and avoid excessive speeds and sharp turns. Riding and alcohol / drugs don’t mix. All drivers should take a safety training course. Call 800-342-3764 for additional information. Check local laws before riding on trails. ©2016 Polaris Industries Inc.